Is there a better alternative to OTF Harmonizer? Is OTF Harmonizer really the best app in Font Tools category? 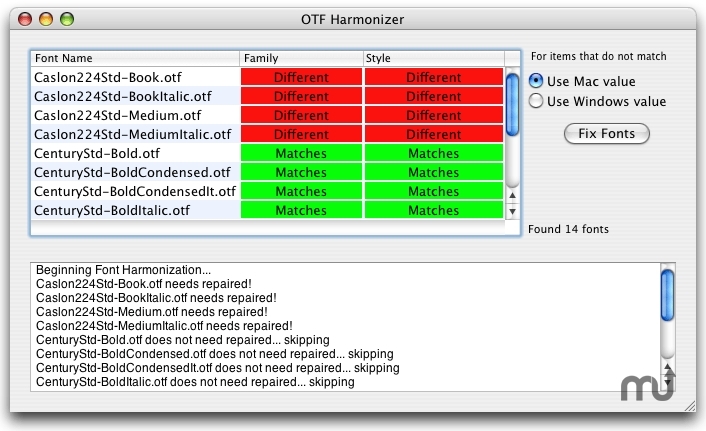 Will OTF Harmonizer work good on macOS 10.13.4? Open Type fonts are a wonderful thing. The same font file that works cross-platform and looks the same in both Windows and Mac OS. But OpenType has a subtle and rarely noticed "defect": the nomenclature for the font's family and style can differ between the two platforms. What Windows would call "Roman", MacOS would call "Normal". Not usually a problem unless you or the cross-platform Java application you are using expects the exact same names in all instances. ftxdumperfuser crashes if the font file is not writable by the user running the application. We now warn about and ingore font files that are not writable. Double-clicking a row will display the family and style names in the log window. OTF Harmonizer needs a rating. Be the first to rate this app and get the discussion started! OTF Harmonizer fixes this mismatch so that both family and style names are the same for both platforms. It allows you to repair entire folders worth of fonts at a time and lets you decide if you want to use the Mac OS or Windows naming. Note that while OTF Harmonizer is a Universal application, it does use a non-universal program called 'ftxdumperfuser' to do the actual font editing. This component runs just fine on Intel under Rosetta (albeit very slowly), but it is not Universal.